The CliMAX-Kid dominated the cup collection at The Giant Awards held at The Yubby late in October 2013. Saturday Batting, Saturday Bowling and Sunday Batting Trophies were all retained by The Kid. 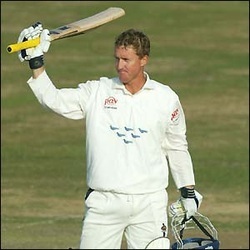 He contributed over 900 runs at an average of 61 across all matches and tool 35 wickets at a miserly 12 runs per wicket. 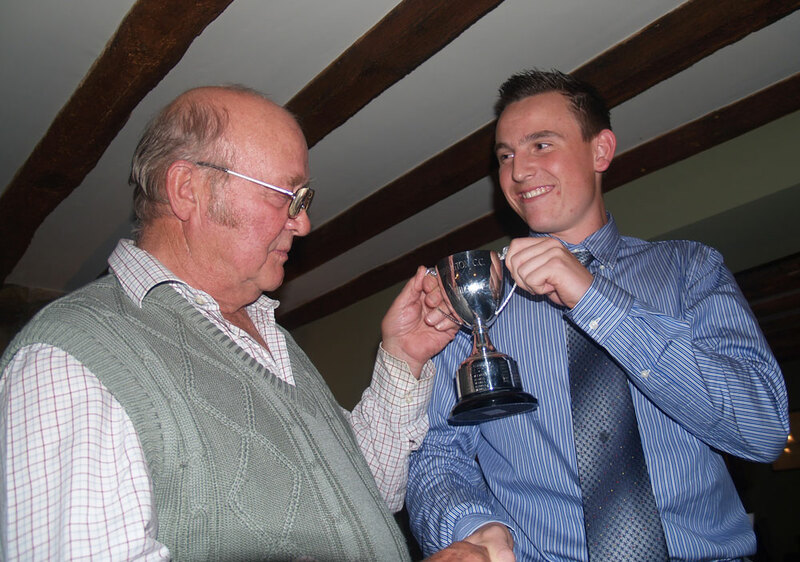 Nat Gregory was rewarded for his incredible contribution to Ebrington cricket in 2012 at the Club Awards Dinner on Friday 21 September 2012. He took the Saturday Batting Award for 855 runs at and average of 106, The Sunday Batting Award for 540 runs at 90 runs per completed innings and The Saturday Bowling Award for 13 wickets at 9.2 runs per wicket. His economy rate was a very impressive 2.4 runs per over. Added to that he took 11 catches, had two stumpings as an occasional wicketkeeper and made two run-outs. 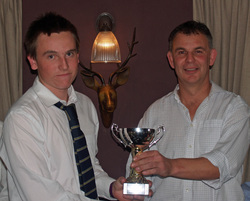 The CliMAX-Kid was also awarded the Player's Player of 2012 jointly with James Hicky-Lix. The CliMAX-Kid, Nat Gregory, has demonstrated the incredible power of CliMAX to develop cricket skills in his massive contribution to Yubby’s Cotswold Hills League effort this season. His strike rate of 133 runs per 100 balls has launched Yubby’s innings at breath-taking speeds and his accumulation of 855 runs at an average of 106.9 indicates a reliability that would be the envy of any team. Previously he had scored two centuries and six 50s in his ten innings of the 2012 campaign and during the last game he was determined to offer peak excitement to those watching. Though he lost batting partners with alarming frequency he raced on: 50 came up from 33 balls, 100 from 83, and 50 came from the next 31 balls and finally he was bowled for 191 trying to reach his first double century with and uncharacteristic heave to leg as the overs ticked down. The Kid had treated the crowd to 26 boundaries of which nine were MAXima. (Of course this would have shot his score up to 317 with CliMAX rules, with one pair of MAXima being consecutive in an over that cost 27 in traditional rules – 6 4 4 6 6 bye). 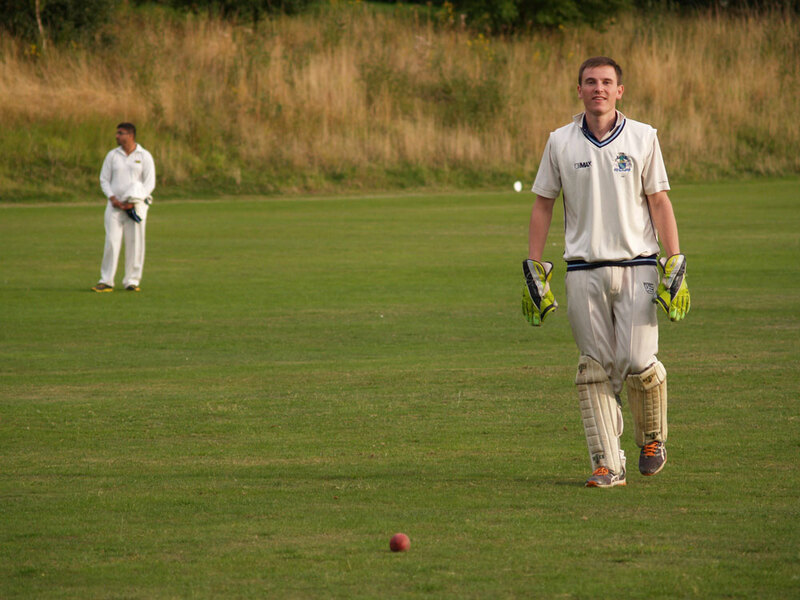 One ball off 44 overs of batting and The Kid opted to don the wicket keeping gloves instead of steaming in to open the bowling in usual fashion. This meant he could not add to his fine league contribution of 67 overs, 19 maidens, 13 wickets for 119 runs; giving an average of 9.15 runs per wicket and a strike rate of 30.9 balls per wicket. 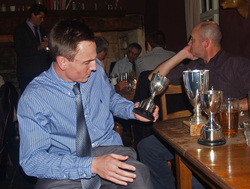 A further contribution to Yubby’s League winning effort in 2012 was The CliMAX-Kid’s fielding. Perhaps learning the value of wickets in CliMAX-format where the runs go back to zero on the fall of a wicket, The Kid clung onto 8 outfield catches and took one more catch and a stumping as wicket keeper. Division Two teams may want to start CliMAXing this winter if they want to stay with The Kid in 2013. He's just a kid - he finds it funny! The CliMAX-Kid is having a phenomenal season as reported in the Cotswold Herald. His 66 ball century produced the highest score this season in the League - 139. His second century, this was the eight time he has past 50 in the league this season and there are 3 matches left to play. What might The CliMAX-Kid had the weather permitted a reasonable number of matches and had his skills been further refined in CliMATCHES? 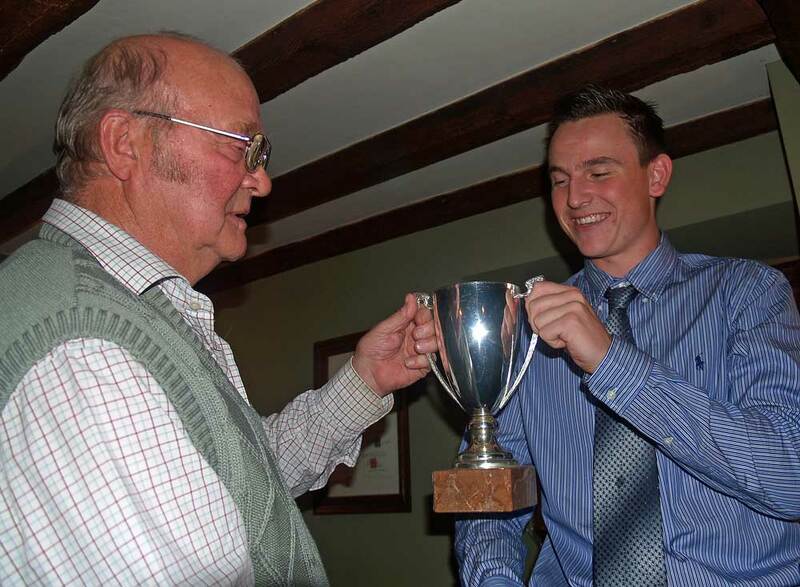 Unable to win the Sunday batting award at Ebrington as Nat managed only 9 innings for Ebrington in 2011, The CliMAX-Kid was determined not to walk away empty handed from the Awards Dinner last Friday 21 October. 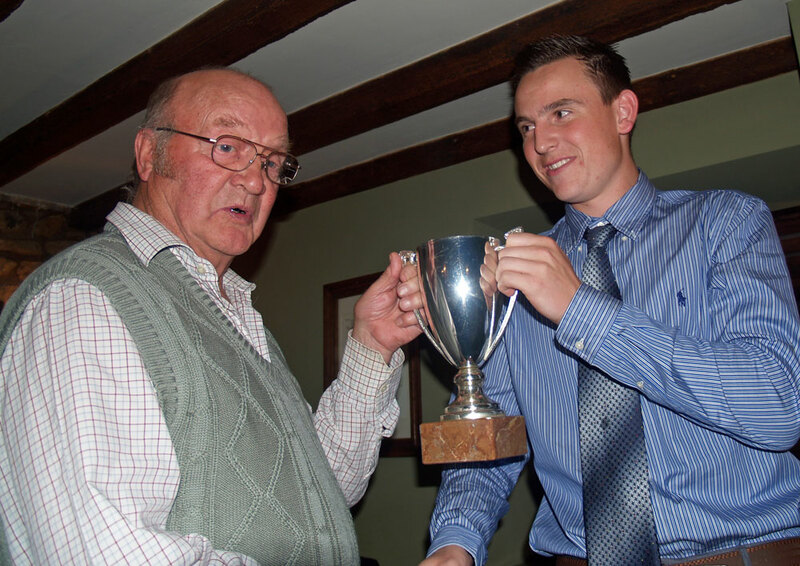 The Sunday Bowling Cup had sat in the family trophy cabinet for the last 2 years due to the efforts of father Peter, but this year it will be The Kid who is off to buy the silver polish. His 11 wickets at 12.92 was just enough to see off dad, who took 11 at 13.64. But let's not forget Nat's contribution with the bat - over 9 innings he averaged 99.7. The CliMAX-Kid's feats have inspired a song which can be heard on YouTube. The song is a little rude and teases many of the CliMAX Originals and highlights their antics since the inception of CliMAX in 2010. Warning - don't listen if you are sensitive to swear words! Banbury were knocked off top spot in MP Sports Cherwell League in losing a tight game with Tiddington and all but lost chance of promotion on the last day of the season. As Banbury batting fell apart, the CliMAX-Kid held steady accumulating 72 high quality runs. Running out of partners, the pressure began to build and being unable to save his attack in this traditional form of the game to the very last delivery, he perhaps went for it a little early. More details are given in thisisoxforsdshire pages. The CliMAX-Kid provided a single handed demolition of one of the strongest village cricket teams in the country on Sunday 21 August. Opening with Father of The Kid (G.Odd), they established a solid century start before The Father was out in the 14th over. The Father had contributed only 21, whilst The CliMAX-Kid blazed to all parts from the very first over. Other partners came and went, but The Kid raced on: His own century came up shortly after drinks and despite losing a proportion of the strike continued to outscore his Ebrington teammates. At the end of the innings The Kid had amassed 158 not out from a total of 249 for 5 in 40 overs. As runs came a bit too quickly for skipper Duckie Clarkson's liking, he felt obliged to find out how much energy the young tearaway had left. The CliMAX-Kid immediately made his presence felt as he bounced ex-professional cricketer Kevin Emery. Emery, in a time warp, thought he would be successful appealing to the umpire for the light. But in village cricket we play on however dark. Frustrated to have his potent weapon taken from him, The Kid pitched the ball up and dropped his pace for the remaining 7 overs and 5 balls. Their protest may have backfired on the Dumbleton batters, as the ball began to swing prodigiously. They hardly laid bat on ball for a while and when opener Carson (79) eventually did, he only managed to squirt it back to the bowler for an easy catch. The Kid finished with 1 for 35, a fine all round performance, whilst The Father of The Kid was more damaging taking 3 for 27 from his 8 overs, and Dumbleton were defeated by Yubby yet again falling a handful short of their target. One of Haydn's regrets was not experiencing CliMAX whilst the Kid himself was down under and willing to introduce this more challenging form of the game to Australia. He is hoping to play CliMAX whilst in the UK, though whether this will be in picturesque Gloucestershire or whether the new form of the game will be embraced in Yorkshire this season only time will tell. CliMAX-Kid comes back with a bang! After 6 months down under the CliMAX-Kid Nat Gregory returned to England in scintillating form. 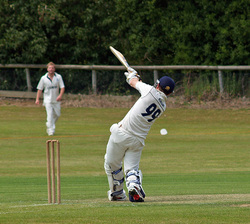 He ringed for Blockley last Sunday against the unfortunate Shipston bowlers. He took a fancy to a bowls rink on the riverside and landed a few MAXimums on or over it whilst accumulating an impressive 89. This had Blockley captain Dan Knight and Stratford captain Matt Corby, who happened to be playing for Shipston, wondering if they could entice the big Kid into their league teams. Nat was looking at higher honours and decided to play for Banbury on Saturday this weekend. He has his eye on a slot in the first team who play in the Home Counties Premier League, though he will have his work cut out as Banbury have strengthened last year’s squad with Luke Radford and Tom Cheshire. However the CliMAX-Kid did his cause no harm at all striking a run a ball 55 before again missing a straight one when walking down the pitch to drive. On Sunday Nat played with for Ebrington, the club that brought you CliMAX last year, at Temple Grafton who’s players were the first to play Classic-CliMAX (11 a side version). Nat soon reminded them why he was prolific in CliMAX and traditional (old fashioned?) cricket last season. He smashed the ball to all parts of Grafton Court until he was out reverse swishing leg before. Scoring 75 from about 50 deliveries this was his 3rd half century in as many games. He even slipped out a couple of wickets in the gloom, to make his £1,000,000 price tag in Ebrington CC Fantasy league a possible bargain. With defeat this weekend Harvey Benger saw their last chance of qualifying for the finals of the Bunbury District Cricket Association competition disappear. Collie batted first and compiled a respectable 241 for 9 in 50 overs. In absence of club captain Scott Fowler, stand in skipper John Crognale turned to CliMAX-Kid Nat Gregory to bowl, admittedly 7th choice. Nat’s return of 0 for 24 was commendable as he went at 4 an over during a difficult stage. Yet again Marshall (4-54) and Shemeld (3-41) were main wicket takers and John Crognale provided best control with 10 overs 1 for 30. A second wicket stand of 87 between Marshall (53) and Shemeld (48) gave Harvey a base to attack this total. Nat Gregory (9), in at number 5 made single figures for only the 3rd time this season, and subsequent batsman could not find the fluency required and the innings folded at 219 in the 45th over [scorecard]. Harvey have one more game to play and that is home to Marist on Saturday 12th March. At least the club has an opportunity to experience CliMAX with Nat before he packs his bags to fly back to England in April. The CliMAX-Kid made hay while the sun was shining on Harvey Recreation Ground on Saturday when title challengers Hay Park Cricket Club brought their powerful first XI to take on the unpredictable of Harvey-Benger. Hay Park batting first found every run had to be battled and Rob Marshall nipped out the dangerous David Exall for a mere 11 runs. Prior to this opening bowler Ryan Redfern had both opener Ben Cross and number 3 Norm Bedford trudging towards the pavilion with ‘imaginery’ ducks following at their heels. Then Harvey really turned the screw on Hay Park with 28 overs from Marshall, John Crognale and Scott Fowler conceding only 57 runs. Skipper had Scottie would have been particularly delighted to remove Ross Knoll (20) caught by Nat Gregory just when he appeared to be ready to accelerate the Hay Park scoring. With Jono Whitney (34) top scoring for Hay Park the innings drew to a close 119 all out in 46 hours. Harvey continued their experiment with the belligerent Rod Shemeld on top of the order, but this back fired this week. Shemeld, John Crognale and Hayden Jones were all out with only 20 on the board. Young Nat Gregory must have wondered if another total collapse of Harvey-Benger was about to occur, though found comfort and support in an excellent partnership with Ryan Redfern who was unmoveable until out with the score on 103 and a contribution of 26 to a partnership of 83 with the CliMAX-Kid. Nat was in fine form and it just took a few more blows for the Hay ‘stack’ to come tumbling down. Scot Fowler and Nat Gregory secured the win by 6 wickets in only 35.5 overs [scorecard]. Harvey-Benger proving they have a team to beat the best, but are just lacking consistency this season. Next week they take on Collie who were beaten by Leschenault in a similar low scoring game this week. Nat celebrated his match winning innings by a visit to watch Aussie Rules match between West Coast Eagles and Gold Coast Suns. Seeing adopted home state Western Australia win this quarter final game in Perth was icing on the cake for the CliMAX-Kid! Following last week’s club batting record, Harvey-Benger were skittled for 103 at Dalyellup College. Flynn 2 for 13, Millar 3 for 15, Robinson 2 for 5 and Bilston 2 for 10 blew Harvey’s illustrious batting line apart. Nat Gregory (11) contributed just over 10% of these runs and the committee were too embarrassed to put the batting card on the Bunbury District Cricket Association website this week [scorecard]. Dalyellup, on the other hand were delighted to post bowling and batting figures, which show how it took them just 25 overs to overhaul the Harvey total with 5 wickets down and M Robinson top scoring with a run a ball 35. Perhaps familiarity with the Dalyellup College proved important and Harvey will be glad to be back at Harvey Recreation Ground next Sunday when they take on the formidable Hay Park. Harvey will also be encouraged that Hay Park lost this week to Leschenault. Harvey-Benger have it all to do in the remaining 3 rounds if they are to reach the semi-finals on 19 March 2011 [ladder]. The CliMAX-Kid was on for a massive score when the Harvey Benger CC innings was drawn to a close at 50 overs. Usual opening partner John Crognale had already tucked into some of the least threatening bowling in the Bunbury District and was only out when his score was on 116. He has support from Rod Shemeld (67), Hayden Jones (23) and Ryan Redfern. Redfern was joined by Nat Gregory at Crognale’s downfall and went on to 99 but was out last ball of the innings with the partnership worth 130. Gregory was well set on 37 and the score – an amazing 369 from 50 overs a record in recent times for Harvey Benger [batting records]. With great confidence skipper Scott Fowler spread the bowling opportunities around to eight players, though curiously this did not include the CliMAX-Kid. Miserly John Crognale clinched man of the match with his 10 overs for on 11 whilst picking up 2 wickets. Fowler and Redfern also took 2 wickets and Harvey recorded a much needed win over Eaton who were 209 for 9 at the end of their 50 overs [scorecard]. Harvey Benger got their season back under way following the Christmas recess with a trip to table toppers Colts at their Bunbury recreation ground. The day could not have started better with Rob Shemeld removing opener Parnell with the score on still on zero, but Daniel Smith (50) and Paul Reynolds (68) were not parted until the score was on 133. Once skipper Scott Fowler had removed this pair the Harvey bowlers had the daunting task of bowling to professional cricketer Murray Goodwin. He blitzed 58 from 44 balls and helped the Colts to an impressive 239 for 6 from 50 overs [scorecard]. Nat Gregory opened with John Crognale (13) and they made a better start than the Colts had earlier in the day. The score had reached 26 when Crognale was out leg before. Rob Shemeld scored fast and the second wicket was worth almost 40 when Nat was aggrieved to be given LBW after his score had faltering on 13. Shemeld was going well with 67 to his name before being bowled. Scott Fowler (32) tried desperately to hold things together but only Marshall provided a sizeable partnership of 43. Harvey Benger’s innings folded when Fowler was out, the score on 219 after 48 overs. Harvey Benger have lost further ground on the Colts and other rivals Hay Park and Leschenault [ladder]. In the fifth and final round of Country Week in Perth today Harvey Leschenault had their chance to beat ladder toppers Albany Cricket Association. Sadly Harvey seemed intent on finishing the tournament early and were all out within 33 overs and with an unimpressive score of 106. With the exception of Brody D'Agostino the Harvey batters were all good enough to hit the ball, but not good enough to keep it on the ground, being out to reliable Albany catchers. It took Albany just 20 overs to overtake H-L's score and opener David Exall was not out for his second half century of the week (66). Nat's contribution was 22 more runs and the last 4 deliveries bowled in the match. [scorecard]. Albany were convincing winners of this ladder, with Harvey slipping away to 4th [ladder]. Meanwhile there was much more excitement at Stan Twightlight Reserve West where the top of the B ladder, Bunbury and District Cricket Association took on WA Indigenous XI with the three Ugles featured on this page yesterday. Opening for Indigenous was the dependable Michael Bailey who scored his 3rd 50 and was assisted by Dane Ugle who was again flying until run out on 66. It was then Liam Ugle who showed his class with 50 not out andhe steered Indigenous to a respectable 225 for 8 from 60 overs. Gavin Farmer took 3 early wickets and Bunbury then struggled to keep up with the necessary run rate. Undoubtedly Bunbury were under pressure when Dan Ugle came on, nevertheless his analysis of 4 for 38 shows what an incredible all rounder he is. [scorecard] Bunbury folded with a disappointing score of 149 all out fro m 52.1 overs and with this famous victory Indigenous overhauled them to go top of the ladder. Harvey Leschenault fared better on their return to Charles Veryard Reserve East against Busselton Margaret River Association. Their victory is mentioned at this link but is lacking a scorecard. We read that a total of 177 in nearly 60 over was enough to see of BMRA who mustered on 81. Perhaps the CliMAX-Kid has returned to bowling fitness at long last. Having a little time to study the fortune of other teams in this competition taking place across Perth, I discovered the formidable batting record of Dane Ugle who plays for Western Australia Indigenous XI. Dane is 22 years of age and has scored two hundreds and one double century in four innings. He averages 121 with the bat and has taken 7 wickets for 31. Surely he will be snapped up for higher honours. He is pictured on the right of his two brothers Keren and Liam here. I wonder how many Dane was score in CliMAX? Harvey Leschenault found the wicket at Lark Hill to their liking, batting first they accumulated 246 for 8 largely thanks to Dane Crognale with a wonderful century and support from Rod Shemeld (25), Mike Parker (27) and our own CliMAX-Kid Nat Gregory (28). Nat also contributed in the field with a catch and run out and helped restrict Eastern Goldfields Cricket Association to 172 with John Crognale (3 for 32) and Ryan Redfern (3 for 46) the most successful bowlers (scorecard). Nat has gone north to represent the combined forces of Harvey Benger and Leschenault Cricket Clubs at the Country Week Cricket Festival in Perth, Western Australia. In the first game at Charles Veryard Reserve East, Hayden Jones scored 61 and helped Harvey Leschenault to 170 against the Williams Cricket Association, but this was not enough as they had been set 239 (scorecard). In the following game at Breckler Park, Nat and his colleagues found themselves against Geraldton Cricket Association. S Bidwell demolished Harvey taking 8 for 39 from 18.5 overs. He had already hit 75 runs of Geraldton's total of 157. Harvey fell short with 142 all out, Nat contributing only 8 once again. Click here to see the scorecard. How does a CliMAX-Original spend Christmas? Answer: - on the beach in Western Australia, in temperatures reaching 38oC, trying to catch sharks. Perhaps not Crocodile Dundee, but that spirit of adventure could have the CliMAX-Kid known as CliMAX-Dundee. The sharks escaped this time, but the stingrays were not so lucky. I wonder if Nat found any Aussie’s with the balls to take him on at CliMAX-Board during the Christmas holiday break from cricket? Will the Harvey Benger Cricket Coaches take on our advice page in preparing the club for the second half of the Bunbury and District Cricket Association League? Harvey Benger CC could not match Leschenault’s imposing total of 237 for 6 when batting at Forest Park North on Saturday. H B CC had the worst of possible starts losing Crognale for duck, but opening partner Nat Gregory (22) was able to rebuild firstly with Rod Shemeld (24) and then with Haydn Jones (32). The problem was that none of the batters could emulate Matt Buchanan (112 not out) of Leschenault, and all got in but produce a sizable total. Harvey Benger’s innings fizzled all out at 183 from 46.1 overs (scorecard). Their supporters must have wished this was CliMAX format to keep their interest in the game to the final scheduled delivery. Still, with a 5 week break from the Bunbury and District Cricket Association 1st Grade competition (ladder), the club have a chance to experiment with theCliMAX format under the tutelage of experienced CliMAX-Kid Nat Gregory. What a Christmas present that would be for Australia! The CliMAX-Kid took his first grade aggregate to 200 and now tops the Harvey Benger batting averages after grasping the opportunity of opening last week against Marist who were only one place behind them in the Bunbury & District Cricket Association First Grade League after 9 rounds. More Cook than Pietersen, Gregory (53) ground out his first half century down under, but was then removed with the H B total on 120. Then, without the acceleration he should have provided at the end of inning having got used to the Forest Park East wicket, H B were only able scrape a total of 158. For that they were largely grateful to dependable Rob Marshall who was stranded on 25 with 9 balls of the innings unused. Marist paced their innings nicely and though five bowlers took a wicket, Harvey Benger were defeated inside 46 overs by 4 wickets (scorecard). Nat did not bowl, despite needing the wicket taking heroics of his early season performances. CliMAX-Kid catches Collie cricketer and shark ! Look at that rod bend! This was supposed to be a quiet day of relaxation after a convincing 7 wicket win over Collie on Saturday (scorecard). Playing at home on the Harvey Rec, skipper Scott Fowler lost the toss and H-BCC were sent out to field first. R Shemeld was both miserly and effective in taking 3 for 19 from 10 overs backed up by another all-rounder John Crognale (3 for 39). Collie found going tough and produced only 179 for 9 from their overs and Nat Gregory had his first catch of the weekend, but this one in the slips. Shemeld, full of confidence, from his opening bowling put bat to ball effectively and scored 91 before departing with the score on 153. Young Gregory could do nothing more than knock off the winning runs. He made 19 not out. The victory keeps Harvey-Benger in third place. They play 4th placed Marist next week-end whilst the top of table teams HayPark and Colts are also pitted against each other. Despite conceding the first total over 200 this season, Harvey-Benger managed to beat Hay Park who remain at the top of the BDCA 1st Grade ladder. Harvey-Benger move into third position and Nat's contribution to the important victory was 21 before he was undone by one that kept low. So much for bouncy Western Australian wickets, perhaps the Turf East groundsman needs to have a word with Ebrington's experienced Ken Smith. Nat Gregory top scored for Harvey Benger on Saturday 13th November. His 32 took Harvey from 52 for 2 when H Jones departed for 16 to 100 for 5. They then only needed 15 to overhaul Eatons slow 114 all out in 45 overs. Thanks to the CliMAX-Kid Harvey Benger only needed 27 overs (scorecard). Without the rewards of consecutive MAXimums Gregory’s run rate is pedestrian compared to hisCliMAX achievements last season, but he is still outscoring his Australian team-mates. The lack of bowling overs for Gregory this weekend must call into question his fitness. Rumours are of a hamstring niggle, but there has been no official line from the Harvey Benger medical team on this. Harvey Benger were in action on the Sunday too and despite home advantage they found scoring runs an uphill battle. R Shemeld, who took 3 wickets on Saturday, was the main contributor with the bat making 30 and justifying his promotion in the batting order. Gregory slipped down to number 5 and was bounced out without a run on the board. Harvey only scored 127 from 42 overs and it took Dalyellup Beach 43 overs to win by 3 wickets (scorecard). Despite the team name – Colts - Nat Gregory’s opposition last Saturday included a player with 20 years test and first class experience in the form of Zimbabwean Murray Goodwin. Goodwin hasn’t played test cricket since the 2000 series in England. He made himself unavailable for selection by failing to return to live in Zimbabwe, instead settling in Australia. He has been a key member of the Sussex team for the last few summers and used all this experience to good effect in scoring a match winning 82. CliMAX-Original Nat Gregory (32) was in positive mood earlier in the day and again shared a good partnership with John Crognale (39), but both were removed by MD Foreman with the score on 111 (see scorecard). Clearly one of the batting team had both feet on the ground despite Nelson and bad luck was heaped on both batters as a consequence! It was opening bowler R Redfern (37) who made amends and took the total to 197 after 50 overs. Colts needed only 37 overs to overhaul this total and opener Norris provided excellent support of skipper Goodwin. Gregory was later to comment on Goodwin, “He was just too good.” However, the CliMAX community know that young Gregory need not be downhearted as this is just the kind of performance Gregory himself will put in before long. Go on, The CliMAX –Kid!